I love being an international community here at F.E.A.S.T., I do. I wake up to learn of activities and controversies that happened while I slept. I stealthily leave messages that I know won’t be seen until I wake up tomorrow, getting my desk clear for just a few hours. Heck: it is already tomorrow to some of my colleagues no matter what time it is. I enjoy my morning coffee on a meeting with a volunteer in Wales who is getting lunch prepared. I have been on video calls where the beverages range from first cuppa to Sundowner to last call. Due to flukes of geography there is only one hour of the day where almost all of our board members are awake, and due to flukes of how daylight savings time works in different areas, even that isn’t always possible. My secret weapon, my daily companion, the tool I depend on is TimeAndDate.com. I honestly don’t know how else I could manage all the scheduling, meeting arrangements, and time management without that site. 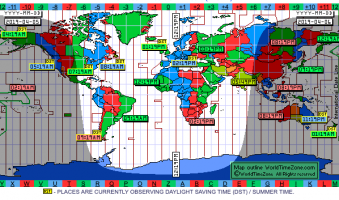 Some day I hope that all our online tools and calendars and devices will recognize some of us have to operate in several time zones at once. Until then, thank you, dear TimeAndDate.com! !